Glazed brick work often referred to as banna-i, Shah-i Zindah, Samarqand. Art in Islam follows the tradition of being non representational, especially in important circumstances such as in the mosque, writing and illumination. The strict style, influenced from the nomadic surroundings when Islam emerged, which restricted the medium of visual decorative art, gives it special appeal, being non-individualistic and not adherent to scale. In writing Square Kufic is the essence of this tradition in its abstract stylized form of the traditional archaic Kufic script. 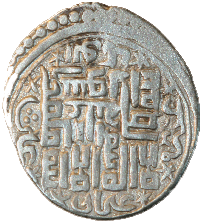 Chinese seal of Ghazan, from his 1302 letter to Pope Boniface VIII. The origin of square kufic may derive from two sources. The first may be from the contact between Islam and China around a thousand years ago. 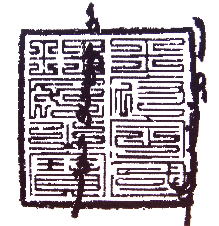 A simple adaptation of Arabic kufic script into the mould of Chinese seal script. The second theory is that square kufic derived from architectural adaptations; in that the architectural tradition in the area where square kufic originated had a long tradition of applying patterns to buildings in a square grid or cartoon. However square kufic came about it created a medium that is unique to human civilization; a perpetually modern medium of representing the divine word. kufic.info was launched in late 2007, as a response to the lack of interpretation of square kufic designs and to create a corpus of square kufic patterns and designs. This site is constantly updated with new material from volunteers; it is non-profit and depends entirely on donations and advertising. Square Kufic is also known as geometric, rectangular, quadrangular, rectilinear or geometric Kufic. 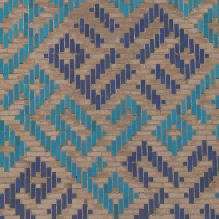 When used to create geometric patterns with alternating glazed tiles with plain bricks, it can sometimes be referred to with a Farsi word banna-i. If the brickwork design is in relief then it is referred to with the Farsi word hazarbaf (hazar baf). Copyright © 2007 George Potter. All Rights Reserved. Latest update 20100511.